Riding a Honda motorcycle is a passionate pastime. It's all about the freedom and sensation of exceptional supremacy and boundless pleasure - the pure joy of powered two-wheel travel. At Honda, we understand your passion and how much you want to protect it. 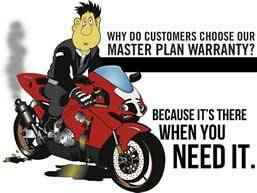 That's why we launched Honda Motorcycle Insurances and Extended Warranty, providing you with access to a suite of tailored motorcycle insurance and warranty products which recognise your riding experience and reward you, the rider. Whether you're a city commuter, an off-road rider or a weekend warrior, we have a cover to suit you, your Honda and your riding style. It's all part of owning a Honda. Don't Risk It, Extend It with Honda Extended Warranty. Honda Extended Warranty is available on a wide range of Honda Motorcycles* and will continue the peace of mind that Honda's standard factory warranty already provides.